The early dawn landscape reveals itself in a gradually dissipating veil of mist, rich in browns and dark greens, the morning colours illuminating the woven thatch huts in golden light. I am far too exhausted and in pain to be able to focus on taking pictures, never mind the continual eruption of violent shaking on the part of the train. 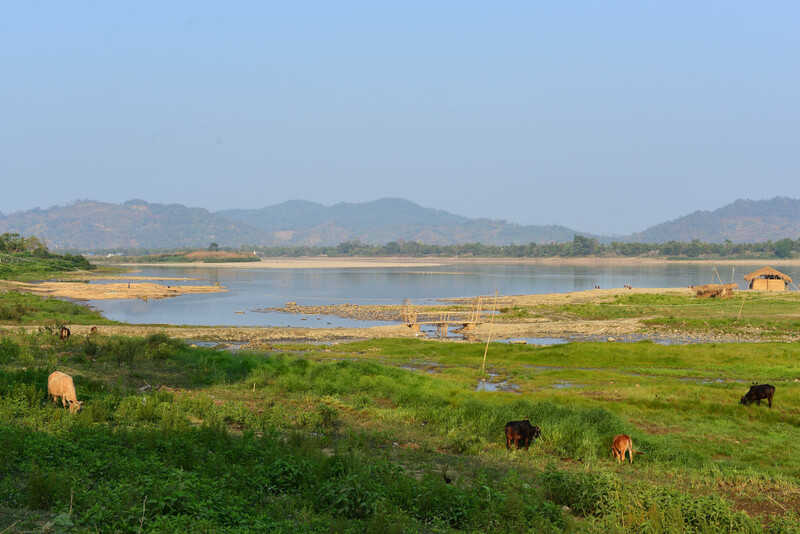 The wide open terrain visible in the area of Shwebo before dusk set in yesterday is much the same, except that low-lying hills now encircle the Irrawaddy basin. If this country is so beholden to insurgencies that threaten its stability – where would these rebels even be hiding? 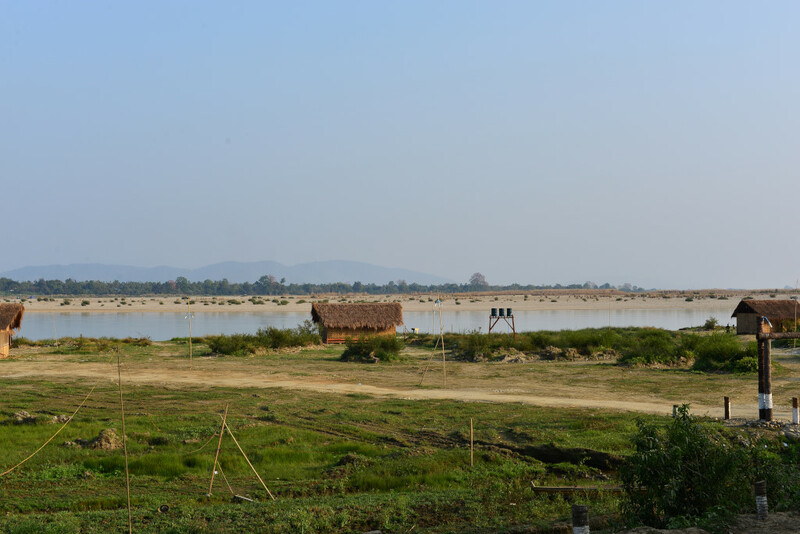 Perhaps farther away from the Irrawaddy, the terrain is far more mountainous and impenetrable, but what I see here is anything but. The train rocks so violently that my large backpack hurtles into the passage, crashing to the floor as it narrowly misses the head of the evidently already quite distressed man sitting behind me. It would be difficult to eat, and in any case, the food that was freshly prepared yesterday is probably in an advanced state of decomposition. It is not clear what the continual parade of young men chatting up passengers wants – are they asking for money? Requesting contributions to the local temples, which I presume the women walking up and down next to the tracks with coins clanging in their metal bowls at every stop are doing? A few muster the courage to speak with me, but I have no idea what they want. And finally, when one of the jacketed young hipsters with bouffant hair who had entered into earnest conversation with the young man sitting next to me for the bulk of the ride heaves the passenger’s suitcase onto his back and follows my former companion into the station, I realize these healthy young men in the prime of life are spending hours of their time hustling train passengers for the privilege of being able to carrying passengers’ luggage for what can only be little more than a few dollars, while most in fact remain loitering in the hallways with no prospects of work, and not for lack of trying. 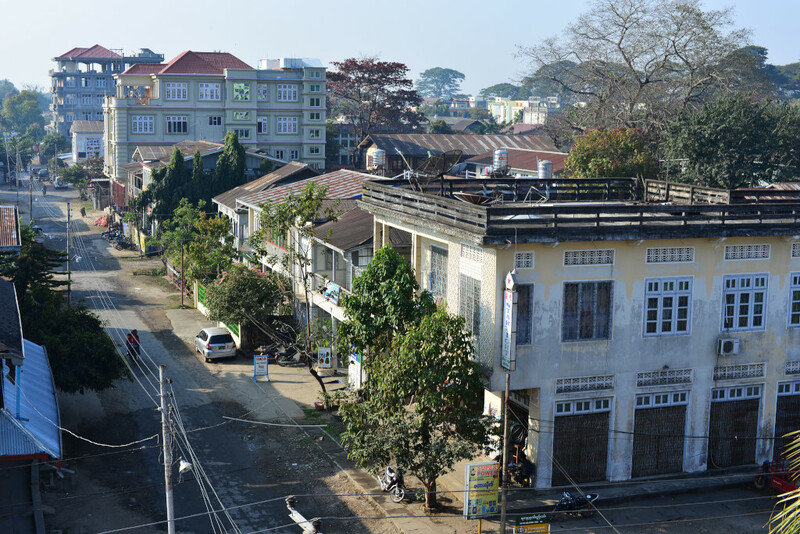 I harbour delusional hopes as the crowd on the train thins out that we are approaching Myitkyina, and that each subsequent town that we rumble into maybe it. 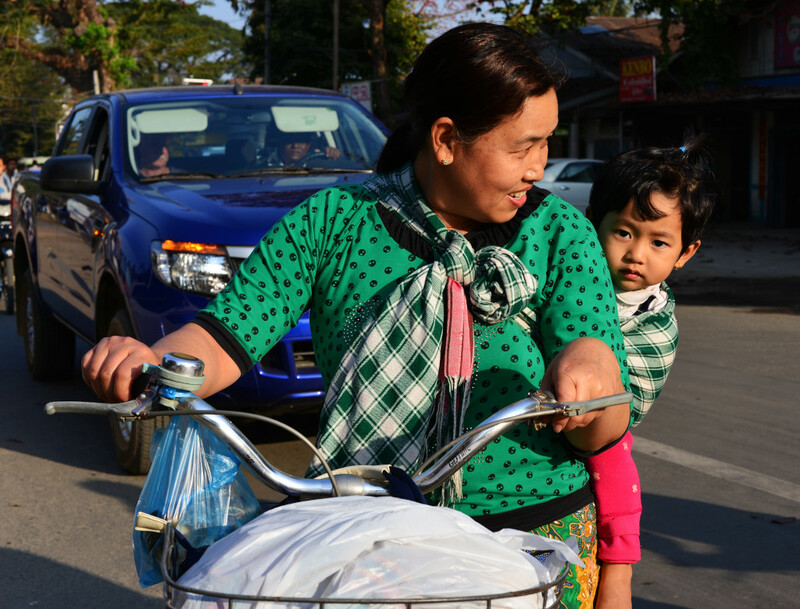 At one point, I point to the ground as we enter the town, enunciating ‘Myitkyina’ to the young woman in front of me. She tosses her ponytail and nods dismissively, as if to say that the town we are in wouldn’t even begin to be worthy of Myitkyina. 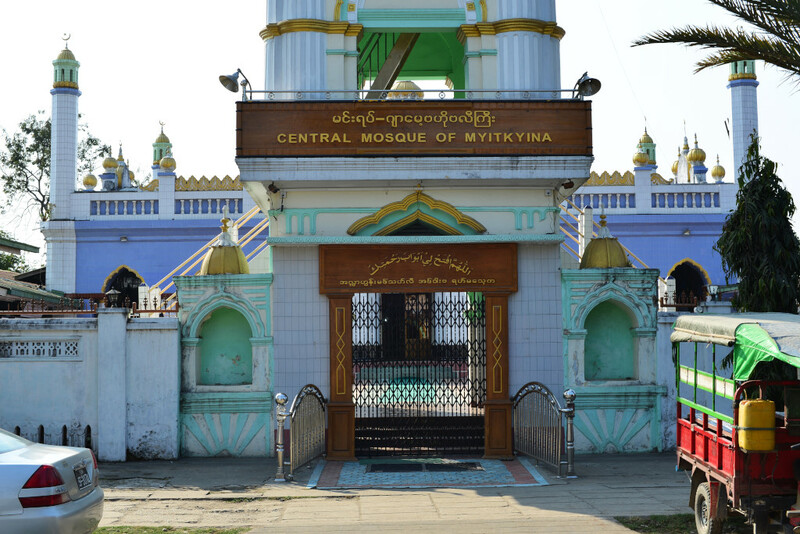 Myitkyina seems like a chimera at this point. My stomach is wracked by pain from being thrown into the air the better part of 22 hours. My left arm, lower back and various other parts of my body seem to be covered in welts. The fact that my right arm is clean and the left has been resting most of the last day on an armrest would suggest that my seat on the train is infested with fleas, adding to the collective charm of the situation. I have probably just experienced the worst train ride of my life, being thrown back and forth violently for the better part of 22 hours, leaving me feeling physically traumatized and exhausted. If there is no way of taking the boat back south, I am flying, if at all possible. It doesn’t really matter how amazing the place I am visiting may be, nothing is worth this kind of hassle. The countryside I took in on the way here has been vaguely charming, but that would be about it. There is really little memorable about it to even justify spending days on a boat coming back here, never mind suffering the indignity of this kind of train trip, even worse in the guise of alleged first class. Closer to our destination, we see one army base, although it is too characterized by that third world dilapidation to appear very threatening. Astonishing as it may seem, some time after 1 pm we actually arrive in Myitkyina, the remaining passengers heretofore slumped lethargically in their seats now erupting from their seats, their possessions being hauled out of the train by the few porters who managed to come up with some work. The man who had with been sitting in the next compartment with the younger man and woman is blocking my exit of the train, wanting to shake my hand before I descend. We made it! Taxi drivers rushing towards me, haranguing me for business. I would be more sympathetic if I didn’t expect to be summarily gouged for the fact that I am a foreigner. In any case, I believe the hotel I am going to be staying in is no further than a few blocks from the train station. And as painful as my stomach cramps are, I really just need to stretch my body a bit before landing anywhere. The unsmiling immigration officer nabs me first and demands that I come into his barren cubicle, recording the details of my passport and visa, then lets me proceed, but not after I issue some blunt comments to him about showing some more respect. But he is not here to chat with tourists, only confirming that I cannot travel outside of town, other than by train or by plane. The Xing Xian hotel that seemed to be the only relatively affordable option in town is of a generic Chinese style, pompous and yet utterly institutional. 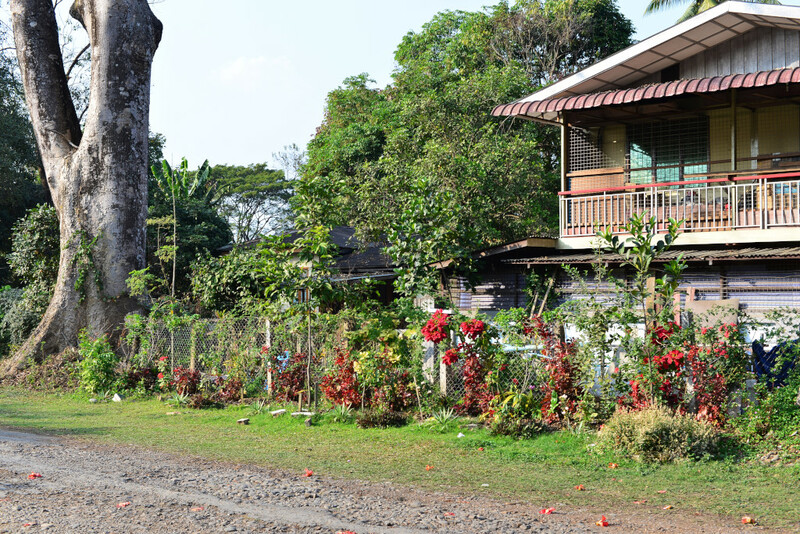 However, it is located in a relaxed and intimate area, between the train station and the river, seeming almost abandoned, the $25 rooms a big step up from the $16 single, which is small, with a small bathroom and a small and very hard bed even shorter than the conventional twin, and with a modest chest. The $25 room is easily twice the size, with a very high ceiling, big windows looking out over the street from the third floor, a fridge, desk, big chest, carved wooden chairs and smaller tables, and two conventionally-sized twin beds. I would normally not even consider spending a dime above the $16, but am now utterly exhausted and debilitated, and feel that I could use the better room, even if it doesn’t have internet. The one drawback of the hotel is the fact that it doesn’t have wifi, so my first mission is to locate some establishment that has, setting me off on a wild goose chase that has me walking through the better part of town with little success. The women working at the reception downstairs motions that there is an establishment with good coffee and wifi just around the corner, which seems somewhat preposterous, as the area seems entirely residential, although quite wealthy and atmospheric by the look of things. I wander back and forth on the main road, and short of an older woman selling me some typical deep fried stuffed pastries, there really is no place that would vaguely qualify as a cafe, unless one of the small entrances to the sprawling houses is hiding some posh establishment that only those capable of reading Burmese could be apprised of. 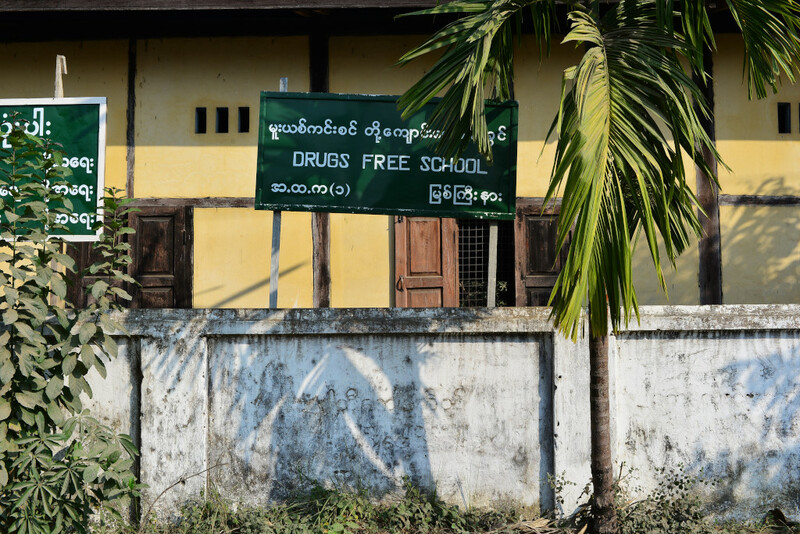 A short block further, amongst the leafy yards, I see the wide gunmetal Irrawaddy river sprawled out before me, and a handful of young people scattered along the road chatting and texting. To my right, the narrow road meanders into the green, and there is certainly no coffeehouse to be seen anywhere. 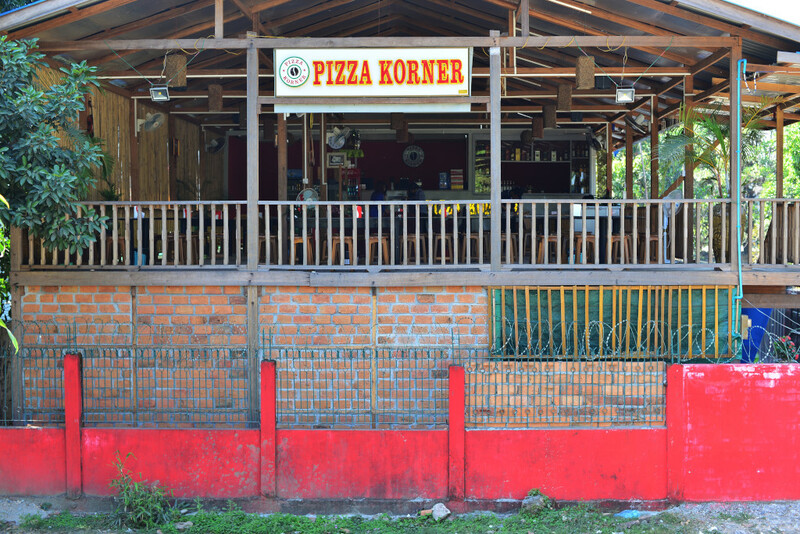 For lack of anything better to do, I wander further along the tranquil road, when to my right the raised terrace of the Pizza Korner appears. Is this the place the workers at the hotel were thinking of? Upstairs, I find a spacious seating area, contemporary pop music blaring from the speakers, abundant power outlets, a specialty coffee menu, a long list of cocktails and a thick plasticized book of pictorially presented food items, including pizzas and hot dogs, and many local specialties as well as those of other countries. I may not trust their western specialties and am too cheap to buy any cocktails here for the ludicrously high prices (5,000 kyat, or $5), considering how cheap alcohol in stores is, but the espresso is not terrible, and the very fact this place is just around the corner from my hotel is an astonishing coup. Less astonishing is the situation with the internet, the password I am given being rejected repeatedly by my laptop, despite the fact that the young man who seems to own the restaurant shows me that the same password is in fact accepted by his phone. 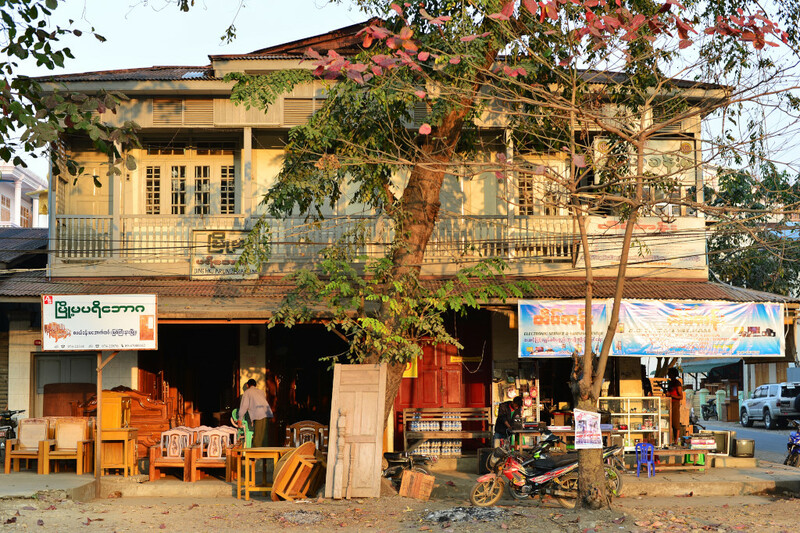 Reaching the area of the train station and its concomitant concentration of retail shops, large and small, probably the best shopping opportunities all of Kachin state has to offer, I wander up and down, asking various individuals as to the possible presence of an internet cafe. Not only do I not find anything amidst the clothing shops, bakery, cellular store, hotels and restaurants, but invariably people have no idea what I am talking about, however positive their intentions may be. The owner of the bakery points to the various pastries he has to offer, but no, I would like to try the shops around the corner. All I find is a series of roadside eateries, far more manageable than what I would see elsewhere in the region, if only because the town is so small. But no internet café! When I bring my lament to the buff owner of one cellular store, he self-assuredly takes on my case, telling me in fluent English that he can bring me to a place in the area. Much as I appreciate his effort, five minutes spent waiting for the Google login screen to appear hardly makes for a satisfying net surfing experience. I walk back to the cellular store, a group of men of varying ages and physical conditions practicing their rattanball moves in the corner, a sport for which the only competition would be European football, which is very popular here. 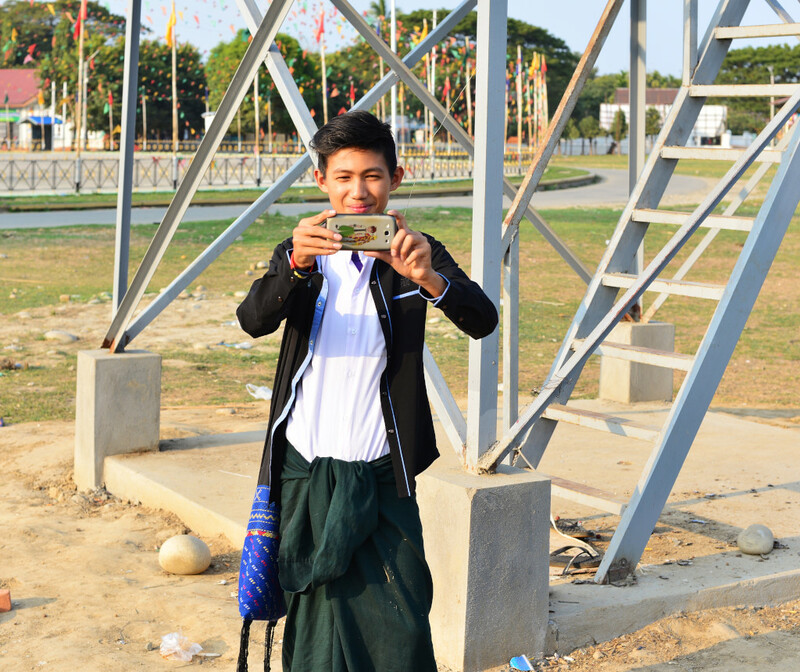 I am given a second choice – for 45,000 kyat I can buy an internet dongle that would allow me to surf the web anywhere in the country using the services of the country’s major internet provider. A great concept in theory, but I would like to see what the performance is prior to laying out the money. And it turns out that the performance is hardly better than what I just experienced in the internet cafe. I leave the cellular shop, thanking the lot for their assistance, joking that I may as well leave the internet for my return to Thailand. Now my search for any place with internet begins in serious, wading into the atmospheric town centre towards the internet cafe I had been told about. 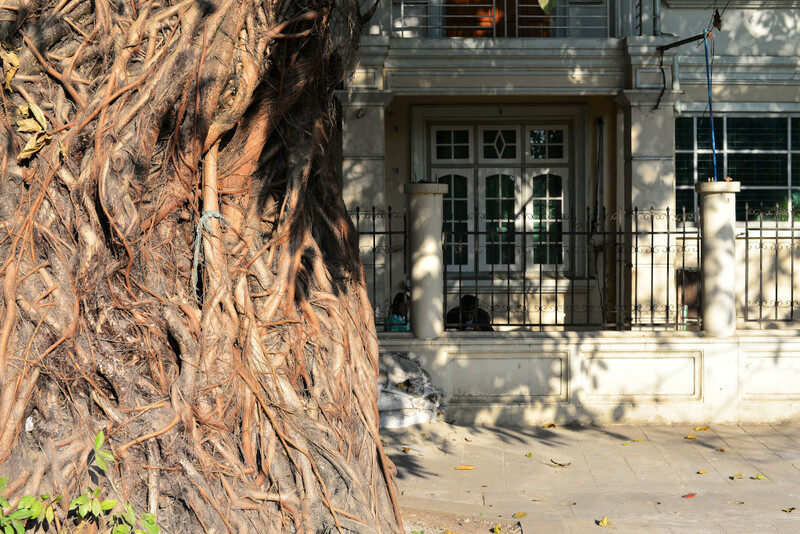 Distracting me is the modern stone architecture set against the more rambling weatherworn teak structures, the streets lined with ancient trees, the beatific faces of the locals beaming as I pass by. 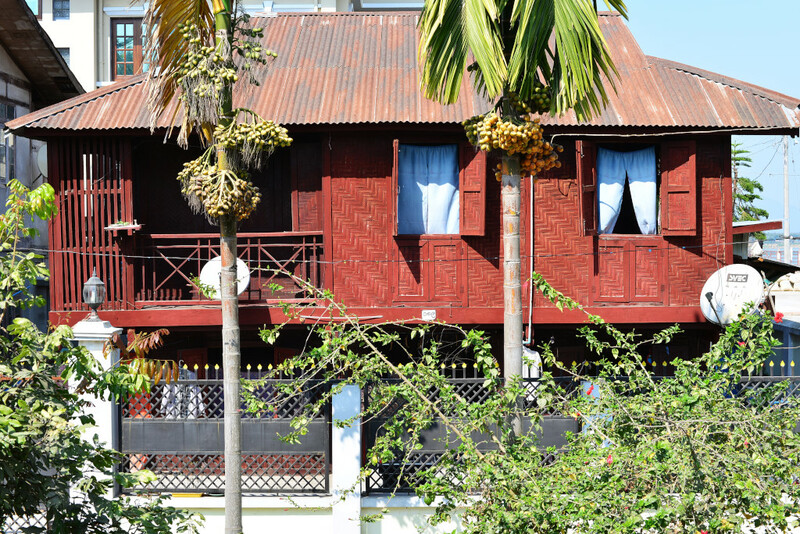 At one hotel I pass by, a single room turns out to be some $30 U.S., which is really more than I want to be paying, even in Myanmar. From the photos I am shown, the rooms appear to have an utterly characterless 70s look, and are not that big. The young Chinese receptionist speaks a clear and halting English, and explains that I could look for the MCC internet cafe, which is apparently located not far from the police station. The big advantage of this hotel would be the provision of wifi, although from my experiences later on in the day, the availability of internet may only exist in theory, as it may be effectively glacially slow and unusable. 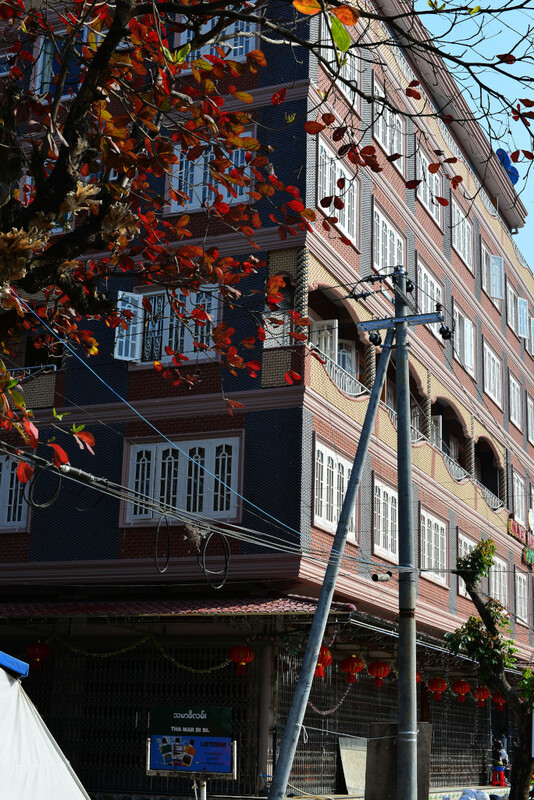 At least the Xing Xian hotel has a relative degree of character and is in an atmospheric location. Distracted by the sights of the town around me, and not paying particular attention to the verbal instructions I had been given for the MCC internet cafe, I show the scrap of paper with instructions to random people on the street, who alternate between being utterly baffled at what I may want and correcting my path. 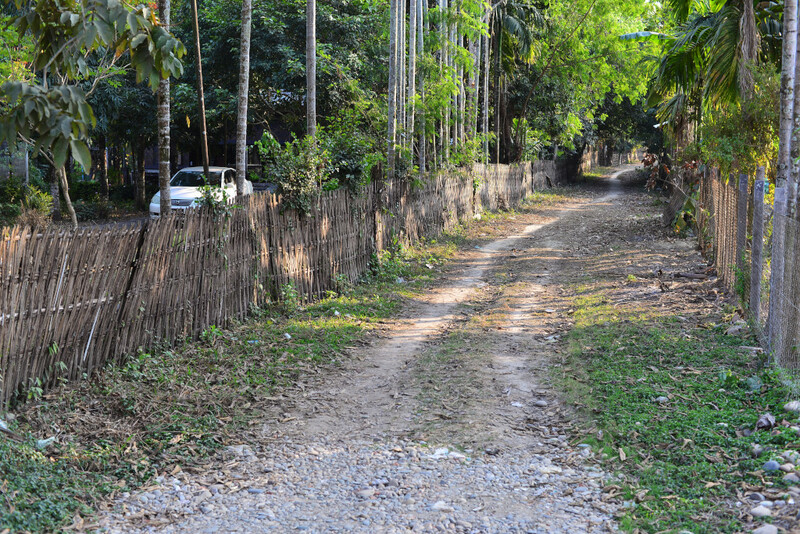 Not surprisingly, the journey in the end becomes far longer than I had anticipated, not that I have much else to do here, and then I may become stuck in Myitkyina longer than I had intended or wanted. 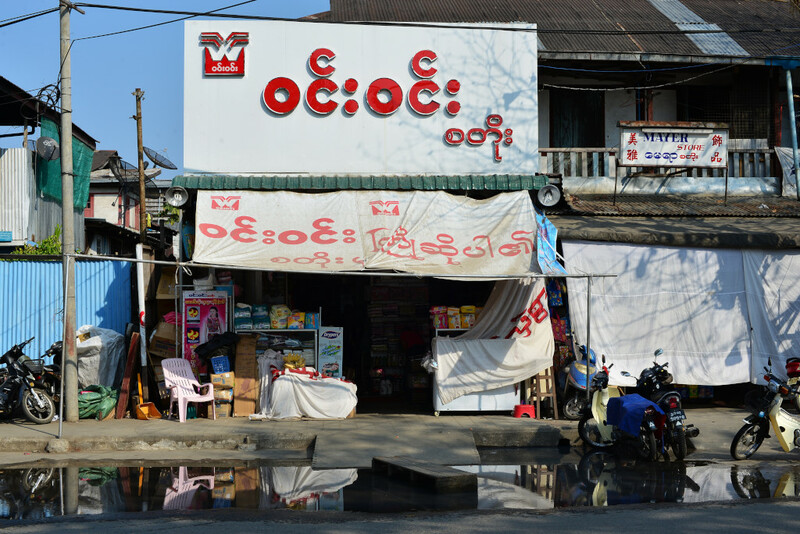 Quite some ways down leafy boulevards, I reach the MCC computer store, where two young Burmese with reasonable English confirm that I have come to the right place. However, the internet cafe is now closed, although I could come back later. They are only too happy to chat with me, although it’s hard to remain motivated, given the frustrations of having just spent so much time looking for the place, and then in utter futility. At least they tell me how to say thank you in Kachin. But later on, when I use the expression with other locals, I get blank stares, either indicating that what I am saying is wrong, it is right and hence not really warranting much attention, or entirely unwelcome. I notice many ethnic Chinese and Indians in town. 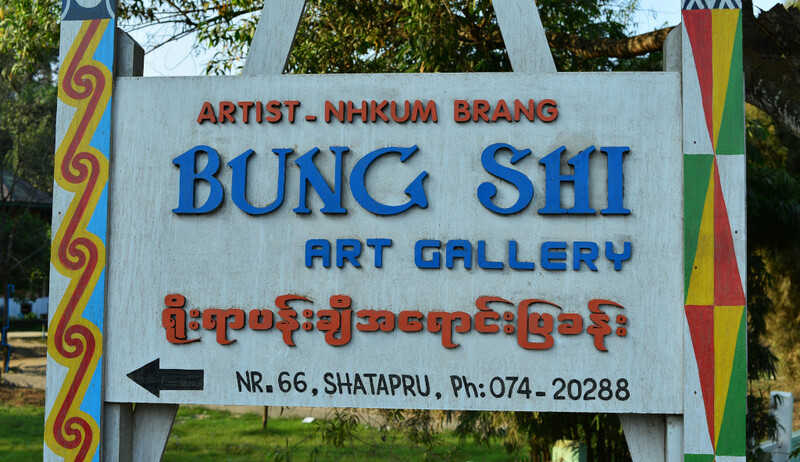 I wonder if they support the Burmese government, having little interest in the ongoing ethnic conflicts in the region. I am told of some other coffee shop in the area that may have wifi, whose name ‘Blizz’ is pronounced as ‘Belize’. The vague directions to the locale set me on another rambling walk, now further out of town to the city’s main park and recreational area. Pedestrians and motorcyclists faced with the scrap of paper on which the name of the establishment is written are again somewhat perplexed as to what I may want, invariably pointing me further, the sole thing they recognize being the name of the park. I wonder how many people driving here are actually heading into the wilds outside of the city, and to what extent the town remains sealed off from the outside world, given the apparent instability of the region. 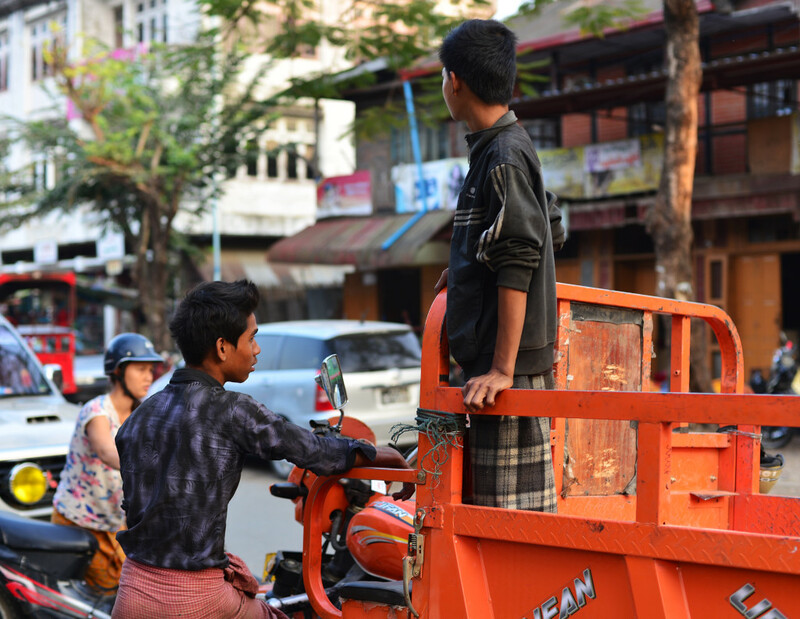 The road jogs past a smaller park installation and small eateries, surprised young men staring at me from their perches on motorcycles as I wander by, small children being ever fascinated with the tall foreigner in their midst. 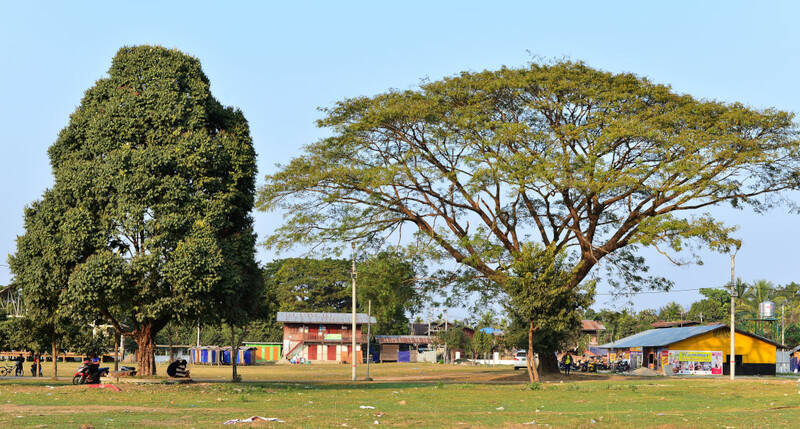 I am continuously pointed further when I ask as to the whereabouts of the park, and I think I now see it, some large municipal structures embellished with a Melanesian-style graphic, erect in the central playing field on top of a large-scale structure, young locals loitering in some of the cafes abutting the park. The park is actually a sports field, with views out over the broad river and the green emptiness beyond, the park grounds offering marginal privacy to a few romantically-inclined young couples and a group of young men who call me to be included in photos of their group, on closer inspection seemingly fairly inebriated and hence poor conversational partners. It turns out that the Blizz cafe sits across from the Cafe 60 on the main road catty corner from the park, except that these informal eateries housed in veritable shacks would have little chance of any wifi. How frustrating to have been sent all the way here for nothing, not that the walk didn’t provide a mildly entertaining and instructive view into local city life. 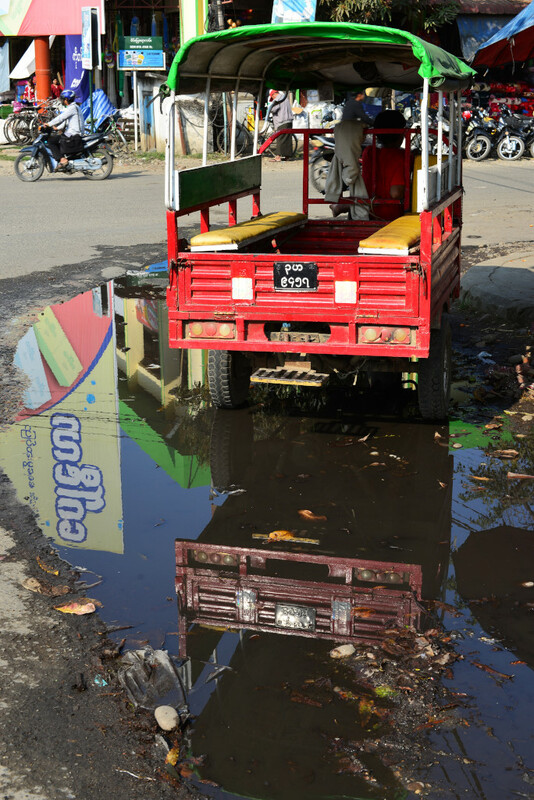 The town has a relaxed and modern feeling, curiously enough, more of a town that would be found in some reasonably prosperous region of Southeast Asia, but not on the war-torn flank of the Golden Triangle. What stands out about the town is what you don’t see. 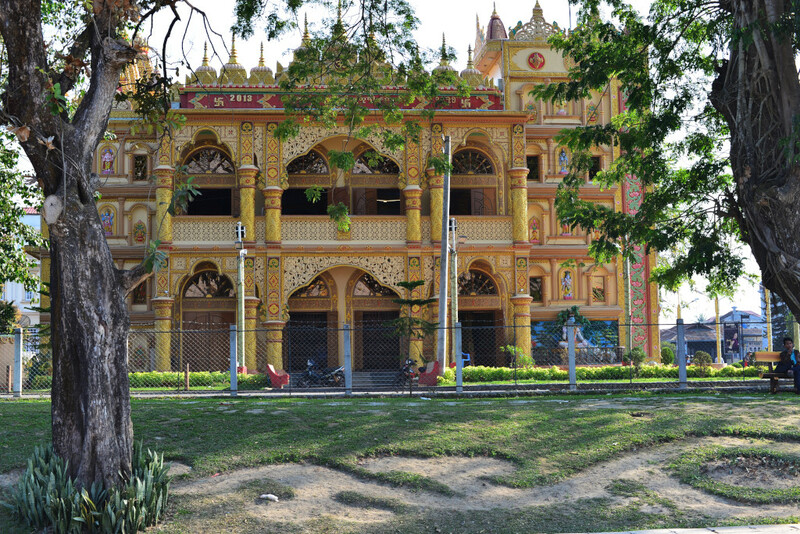 For example, I think I saw one single Buddhist temple in the central town area. 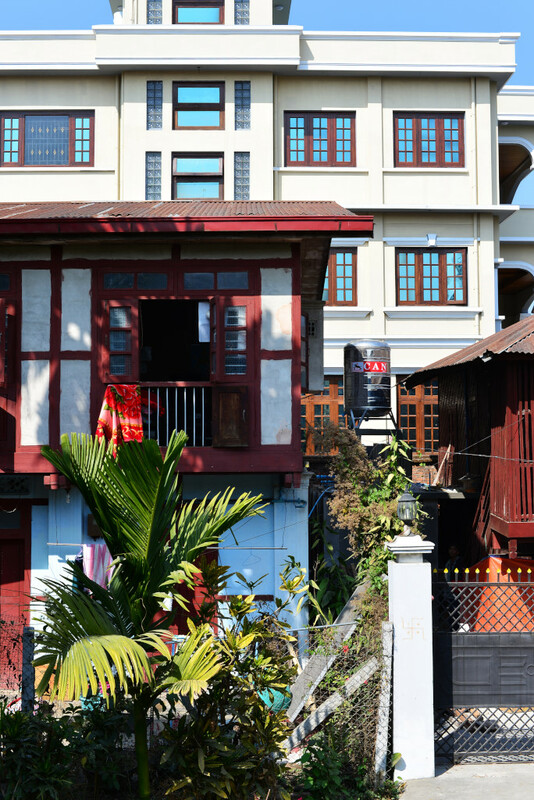 The town has a sense of serenity and even prettiness, with ample traditional teak houses in a good state of repair, and a few colourful religious structures thrown into the mix in the town core. I ask myself how it can be that the Lonely Planet guide doesn’t provide maps for less visited destinations such as Myitkyina. 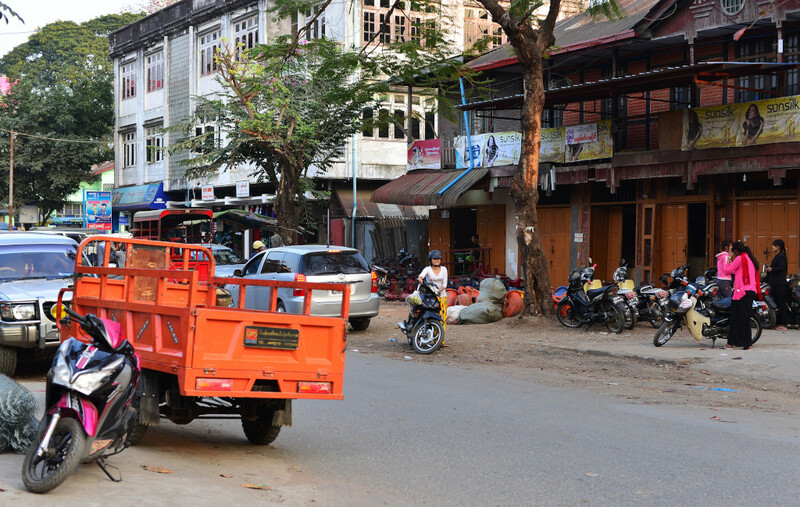 It just makes trying to navigate such a town that much more hassle, especially given that there are no internet connections that could be used to check addresses. Wandering into the darkened area that I think I am staying in, I remember that I had wanted to buy some fruit at one of the cross streets close to the hotel. 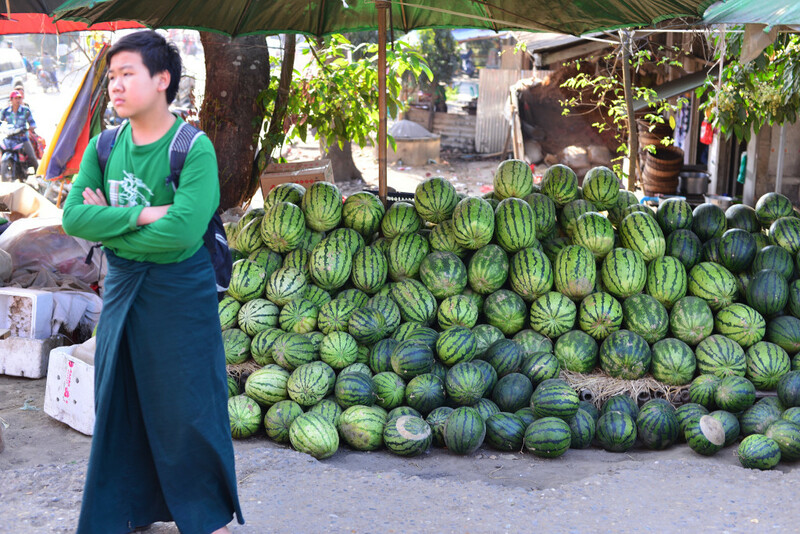 I ask for the prices of oranges – 500 kyat for an individual one of the lower quality oranges, and 4 for 2400 kyat for the better ones? 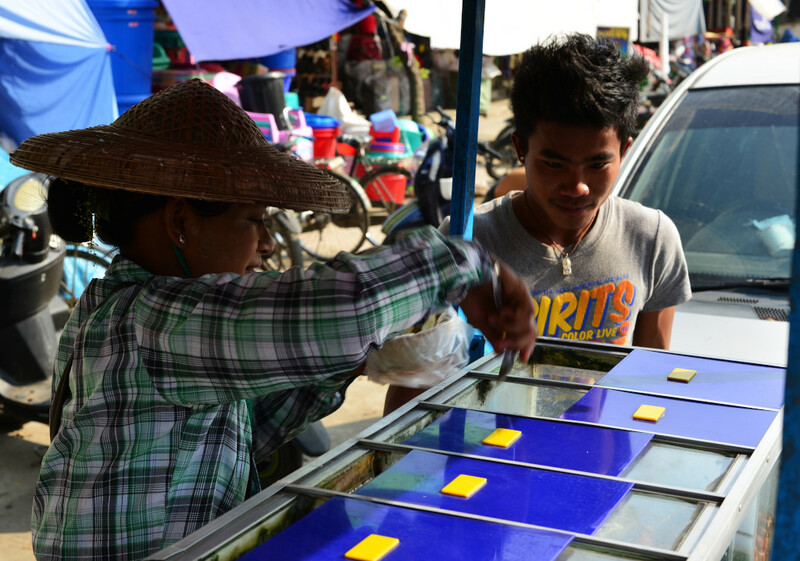 1,500 kyat for a dragon fruit? You’d have a hard time selling those in Canada – so who actually buys them in a country where the average worker earner $3 a day? The economics of this business elude me completely, but I am sure not buying into those utterly ludicrous prices, as thirsty as I am, and as much as I crave the taste of fresh tropical fruit. Once upon a time this stuff would just be given away for pennies – so what has changed? Down another side street, the tall, ornate backlit structure on the next block is the waterfront mosque, meaning that the taller building down the orthogonal street is the Xing Xian hotel. For a generic budget hotel that does not necessarily get rave reviews, the Xing Xian is actually a great and atmospheric choice in probably the most charismatic neighborhood in town, not that I have seen very much here. 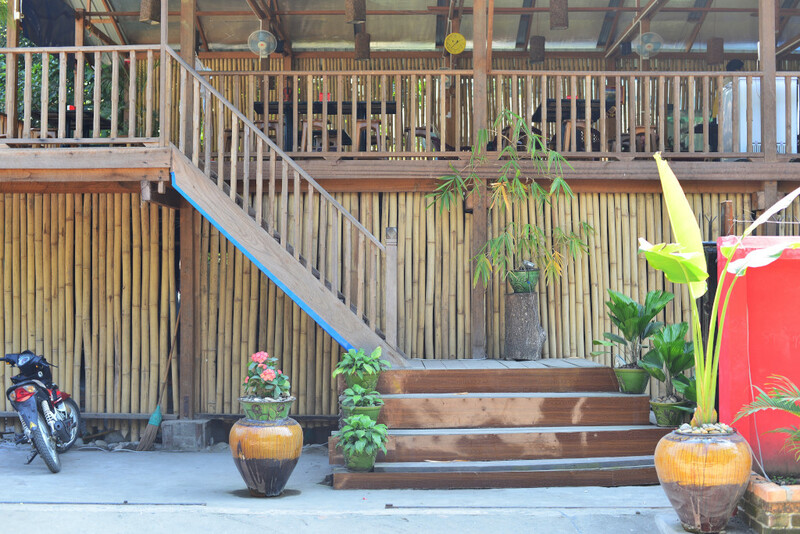 While Myitkyina offers a fairly relaxed ambiance, and there are sufficient humble and inexpensive eating options, certainly near the railway station, the layout, ambiance, food and drinks menu and location of the Pizza Korner restaurant is so ideal that you wouldn’t want to consider going anywhere else. The standard Korean bimbobab is pretty close to convention, although the accompanying kimchi is horrid; the chili tastes like a blend of chili and pad Thai, but not to its detriment, considering the exotic ingredients the dish is served with, include fresh whole green pepper. The young woman who seems to be the owner approaches my table and asks if I have an internet connection. I hadn’t even bothered trying, but now that she asks, I locate the restaurant’s signal, activate it and enter the password I remember from earlier on – and a connection is established – incredible! How is it possible that I entered the password repeatedly earlier on and it was rejected – and now it is accepted? The connection is fast, but I expect the worst, quickly answering as much of my essential email as possible before losing the connection again. The usual skimpy breakfast in the rooftop restaurant at the hotel, accompanied by an older and quite serious American from Boston who lightens up when I tell him a few jokes about Paul Theroux, of all people. Although I am not necessarily always in thrall of Theroux’s writing, I share his often somewhat disgruntled and misanthropic views and the incongruity of his perspectives as a traveler. The American lives in Singapore at the moment and also came here for the weekend out of a desire to see an unusual and different place in the region, although given the apparent beauty of the town, it seems sad that we can’t really see much beyond. Certainly the views from the top floor onto the surrounding rooftops is quite impressive from the perspective of the architectural styles employed, the amount of foliage present, and the relaxed pace on the street. My first effort of the day involves trying to get a flight out of Myitkyina. Unfortunately, the clear instructions to the receptionist today become a lot murkier, amongst others because she doesn’t seem to remember the name of the travel agency. 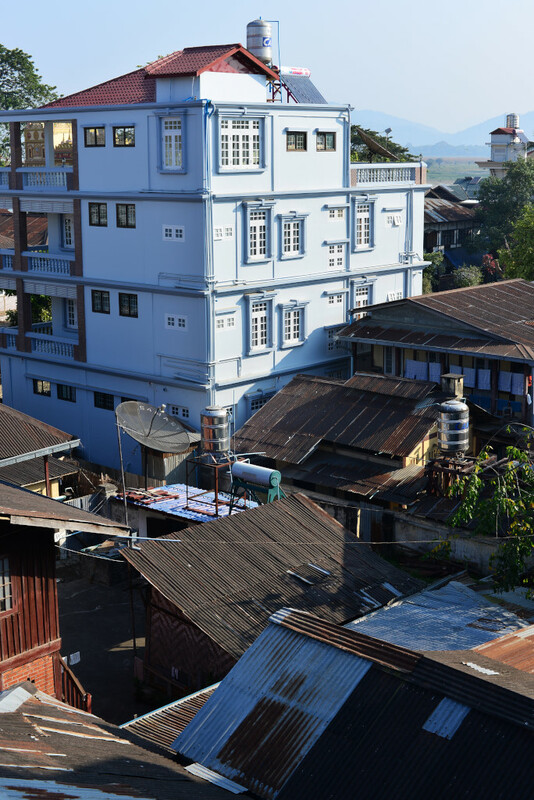 She sends one of the young men working at the hotel to navigate the mean streets of Myitkyina in search of the travel agency whose name begins with the word ‘Snow’. He wanders with me in the quiet blocks around the hotel, a few telephone calls later finding what he was looking for, an empty room in an old wooden building inhabited by a very demure and face-chalked woman in her 40s who speaks reasonably good English, and is happy to help me, at least until my questions become too annoying. 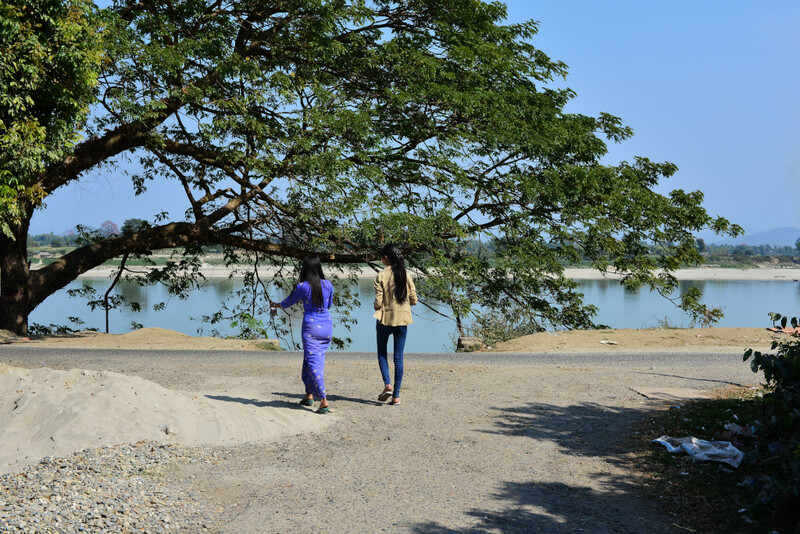 She confirms that it is only possible to travel in the direction of Bhamo by airplane, and return to Mandalay by train or plane, but not by road or boat. 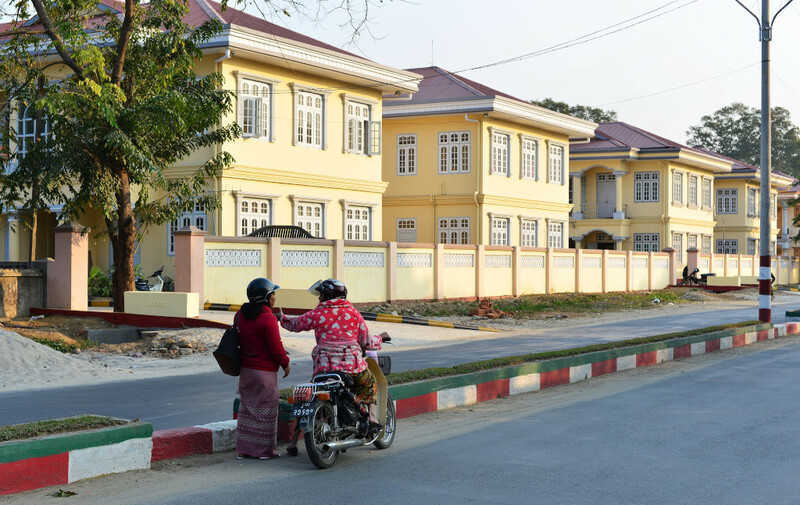 The area may appear tranquil but, there are still issues, and even though Burmese can in theory travel freely in the region, they choose not to for their safety. 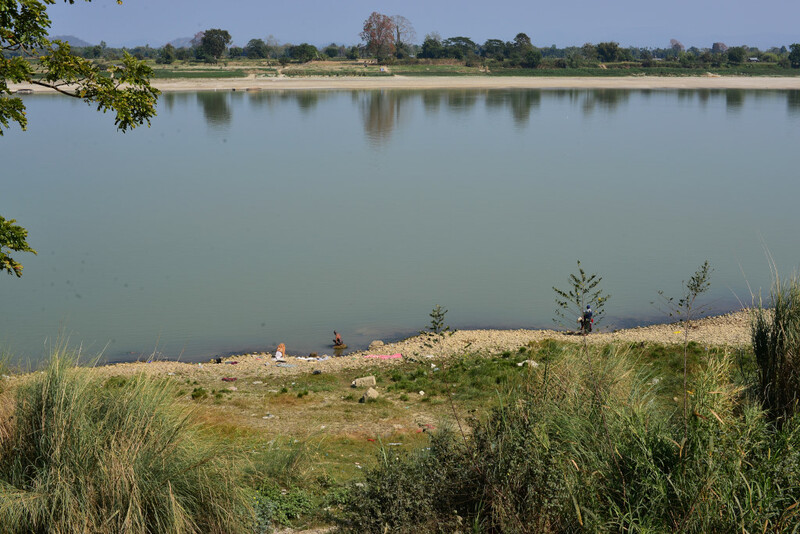 From Bhamo I can travel freely by boat or otherwise, but not from here to Bhamo, as the river is not secure in this region. There are flights to Bhamo – they depart on Friday and Sunday, which means the soonest I can leave here is Friday, throwing another handful of days out the window in my limited stay in the country, not that I expected things to be different. That also means I will also be spending the next three or four days with little or no internet, but that is also what I expected. Otherwise, Myitkyina is ironically probably one of the last places I would resent being stuck in. 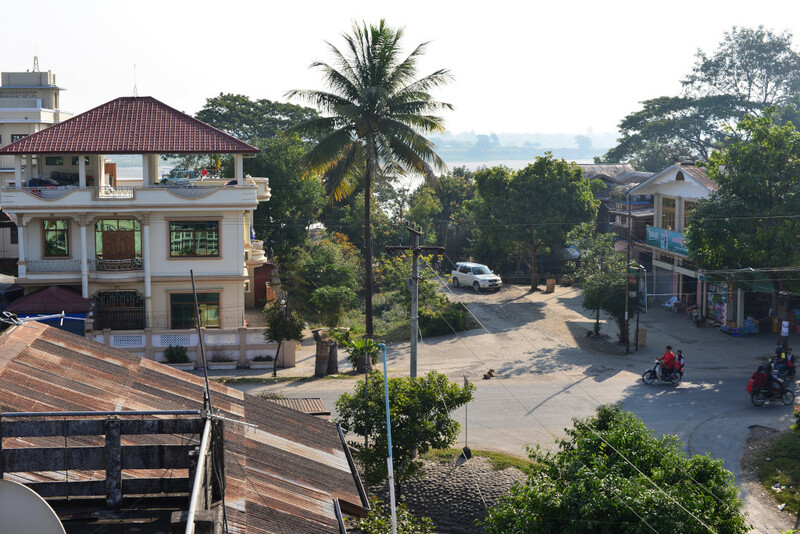 At least I have a very comfortable, clean, and quiet hotel room to stay in, not to mention the fancy Pizza Korner establishment around the corner and the beautiful views of the tranquil Irrawaddy river. 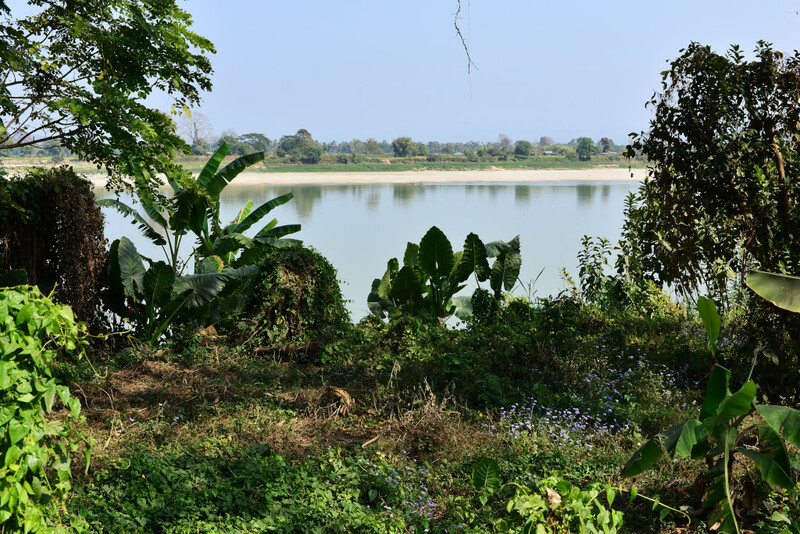 The walls of the travel agency show faded posters of verdant mountainous landscapes which she confirms are from the area not far to the north of Myitkyina. In fact, the mountains begin at Myitsone located at the junction of the Irrawaddy and some other river, a town I can in fact visit. Unfortunately, a guide to the town would cost some $30, and the rental of a motorcycle some $20 to $30 a day. Thinking back to the crew of young men spending hours chasing up business worth a few thousand kyat, that price seems fairly excessive for rural Myanmar. 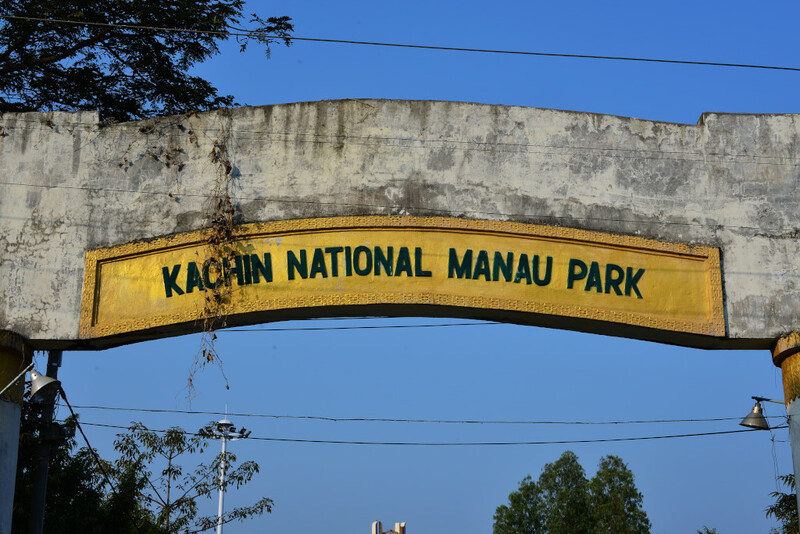 Why this town is so expensive she can’t tell me – it’s not due to its isolation, rather, due to the fact that it lies on the trade route from China, the road running east/northeast directly to the border, and not northwards through the Kachin mountains, as I had thought. 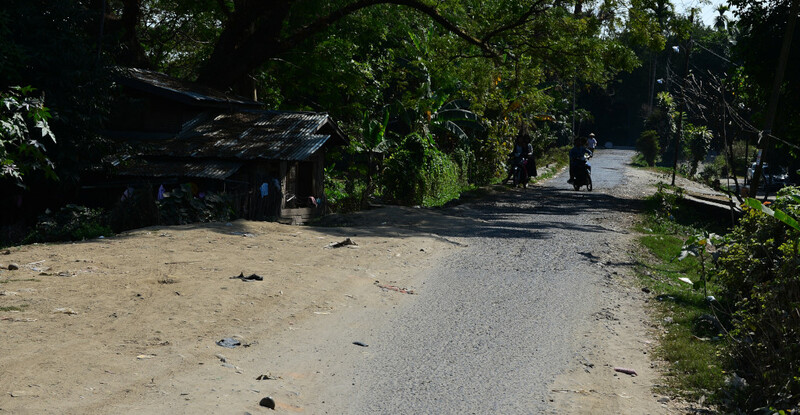 From Myitkyina I could at least visit the village of Whynor, essentially across the river and some ways up, which is the goods exchange transfer point for trade running along the highway running east/northeast towards the Chinese border. To get there I could even go by bicycle. 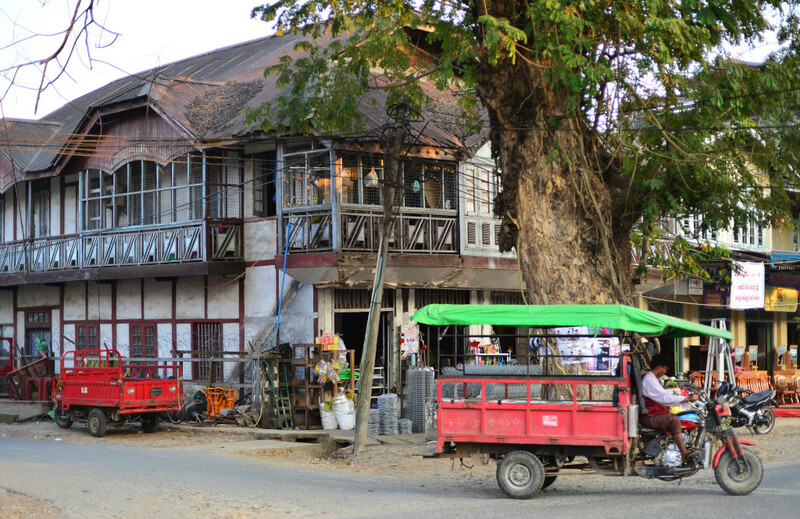 She begs to differ about what the Lonely Planet Guide wrote about Putao – it is in fact a pretty town, much like Myitkyina. Perhaps I can look into flying there from here, rather than to Bhamo, particularly if the town featured some worthwhile attractions. A minor confusion arises at the hotel when I try to explain that the refrigerator in my room doesn’t work. At first it is not clear that the staff understands what I am referring to, but then a young worker is finally sent to look at the fridge in the room. Crouching behind the fridge, he points to the power management box into which the fridge is plugged. Since all the expected lights are on, the fridge must work – but it isn’t, I tell him, pointing to the unit’s motor and pressing my ear against the fridge. Our gesticulation goes back and forth, then we move to another room, where a similar problem seems to arise with the room’s fridge. We migrate to a third room, and there the fridge motor does kick in after being plugged in. Returning to my original room, one of the employees points to the frayed power cable of the power management box, which provides a reasonable enough explanation. The prognosis? I change rooms! 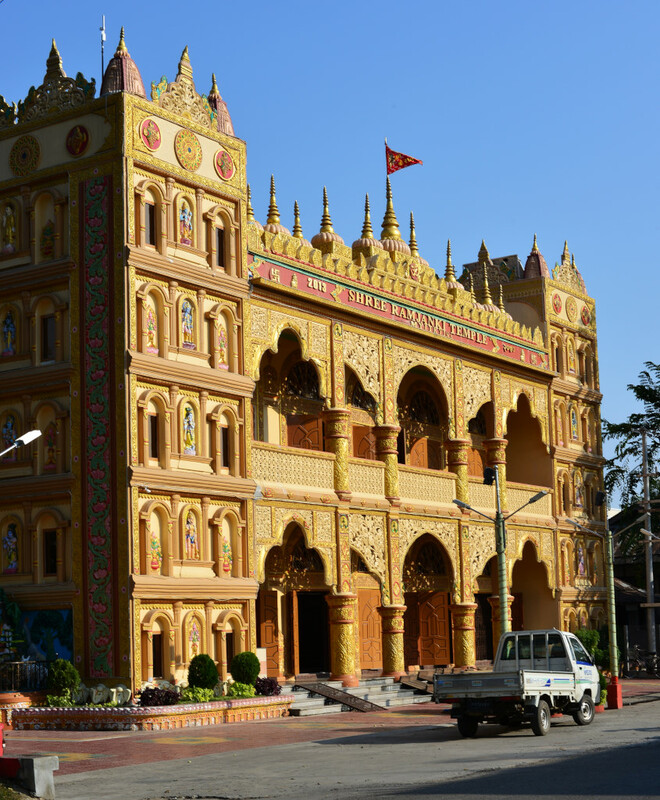 On my search for Myanmar Airways, I walk along the riverfront, past the brilliant golden facade of the Hindu temple on one side, and the park fronting the elaborately tiered golden pagoda. 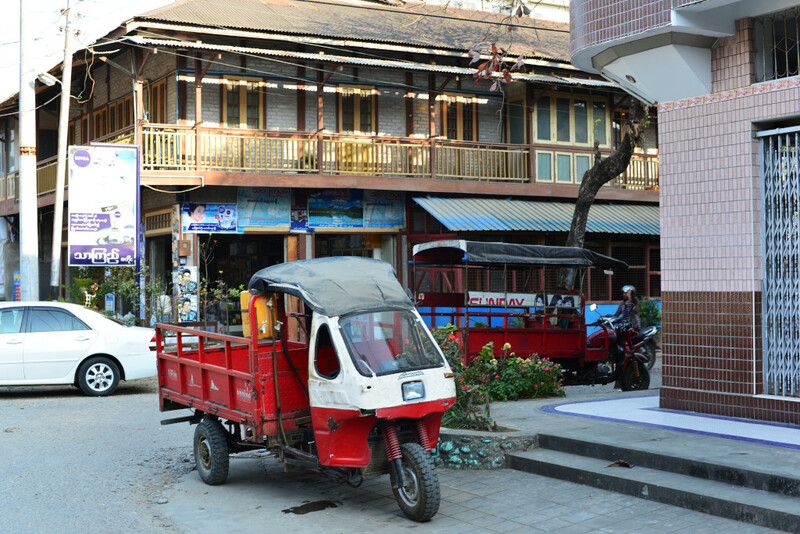 I continue into the historic centre of town with its teak shop houses and commercial activity, stopping to take photos of some of the many people beaming in my direction, pretty young women and women with young children always easy subjects, and what seems to be a fairly expert game of shuffleboard along the main road running past the train station towards the police station. The polite young women in the stores selling bulk snacks are only too happy to be of assistance, but the young men seated at the pan shop are unusually skeptical at my presence. The large fire station is an object of fascination, considering the well-maintained exemplar of what would in a western country be historic fire engines, but evidently very much in use here. A group of green-shirted young locals is practising the somewhat shoddy dance moves intended to advertise some cellular service, although at least they seem to be enjoying themselves somewhat. A woman in a larger clothing stores tells me that perhaps I should forgo looking for Myanmar Airways today, as the office is located by the hospital, at some distance from where we are standing, and the office could well be closed already. 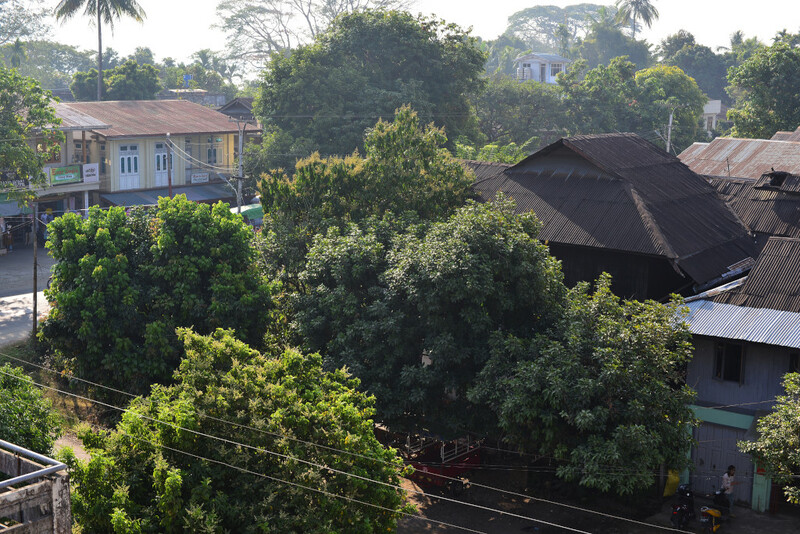 The YMCA is set on a side road running alongside the railway tracks, a shambling old structure from some other era, just as I remember some of the organization’s buildings in other places in India and Myanmar. Seated on a bench in front of the hostel are an older American couple from Tennessee. 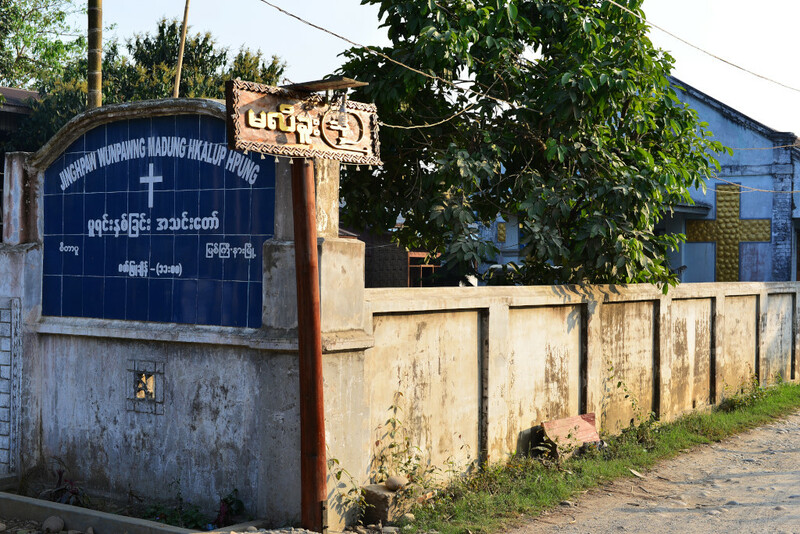 They live in a small town near San Diego when they aren’t in fact living in Baja California when they aren’t in fact abroad assisting in orphanage projects such as the one that will be opening up for the organization they are working with here in Myitkyina. They mention another traveler they had met recently who had wanted to descend back towards Mandalay by boat, but due to skirmishes that occurred in the last week or so in the area, the boat trip had been closed off to foreigners again. 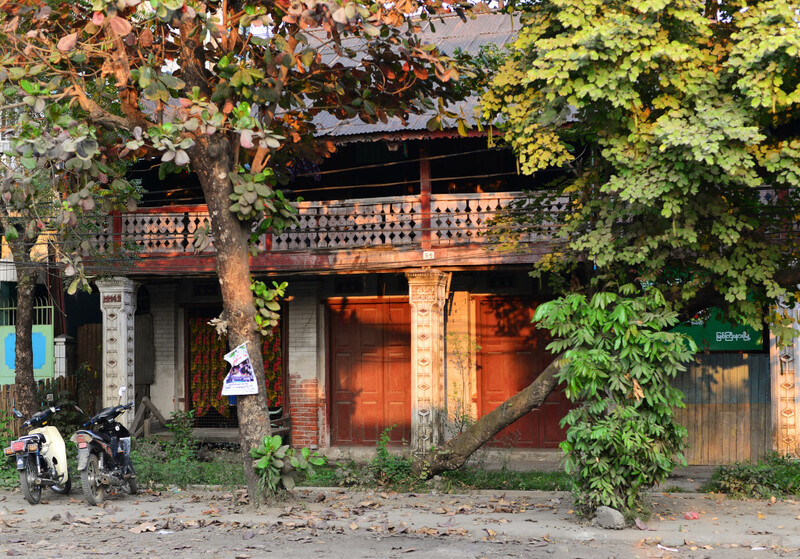 While the insurgent groups would not necessarily be targeting foreigners, they have long-standing feuds with the central government based on having been offered a fair degree of autonomy at the time of independence, which the military junta immediately reneged on when it came into power. 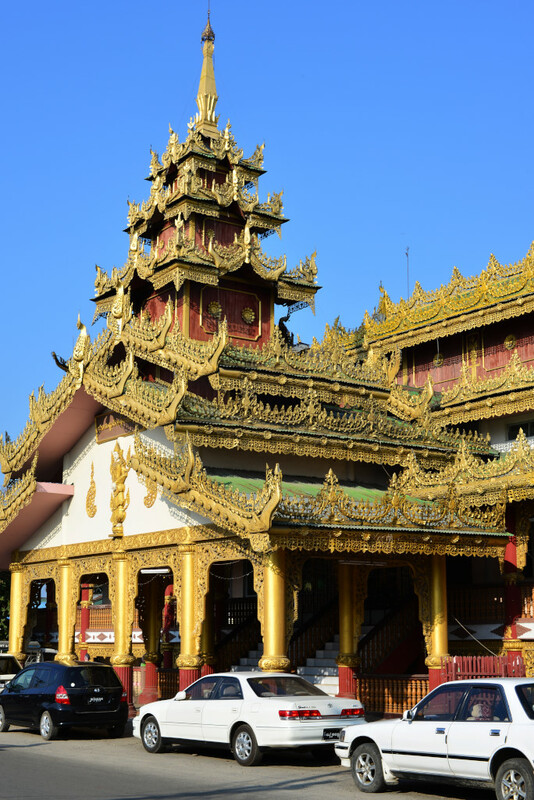 One of the most expansive and scenic of the states of Myanmar, located at the northern tip of this westernmost country of Southeast Asia, and populated largely by Chinese ethnic peoples. To the north of the state, mountains rise up high, unlike the largely low-lying plains that mark much of the core of Burma. 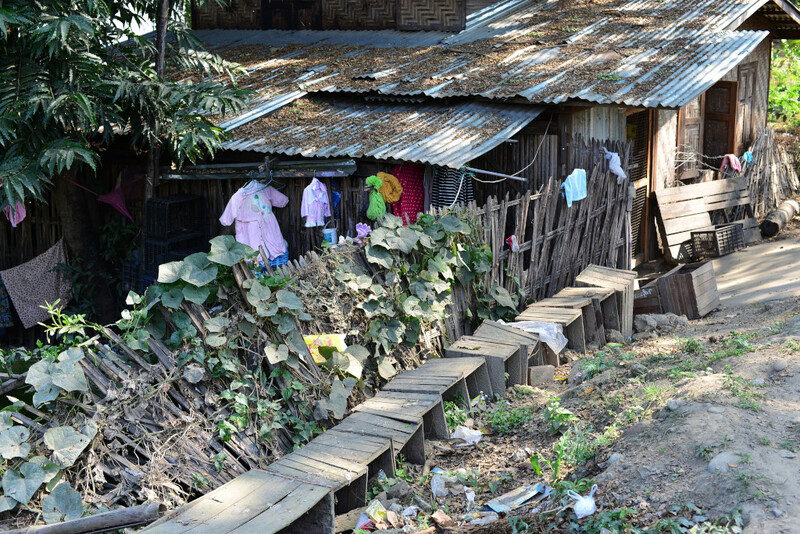 Kachin state is also one of the country’s most marginalized and marked by the inequities that plague the country. Following the abandonment of the country’s constitution by the notorious leader of Myanmar’s junta in 1962, the Kachin Independence Army (KIA) was formed to fight for independence of the state. 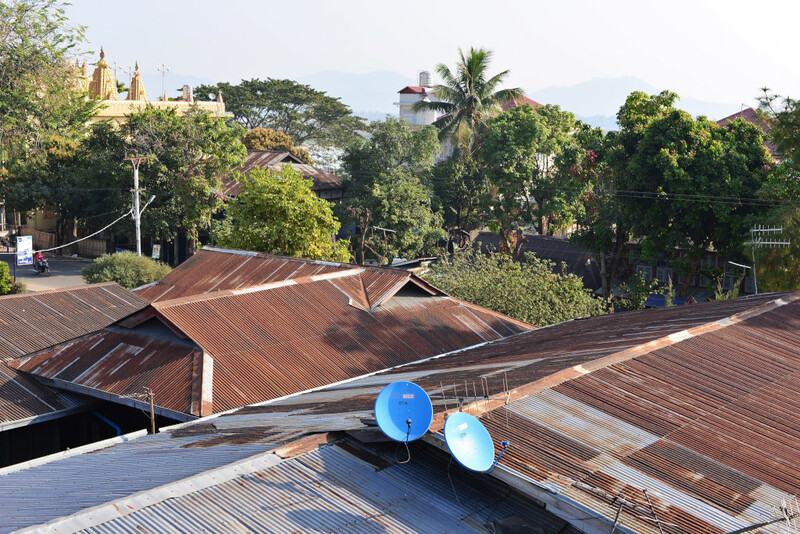 While the major towns and rail corridor close to the Irawaddy snaking up into central Kachin state remained under control of the government of Myanmar, the outlying areas of the state were lost to independence forces. 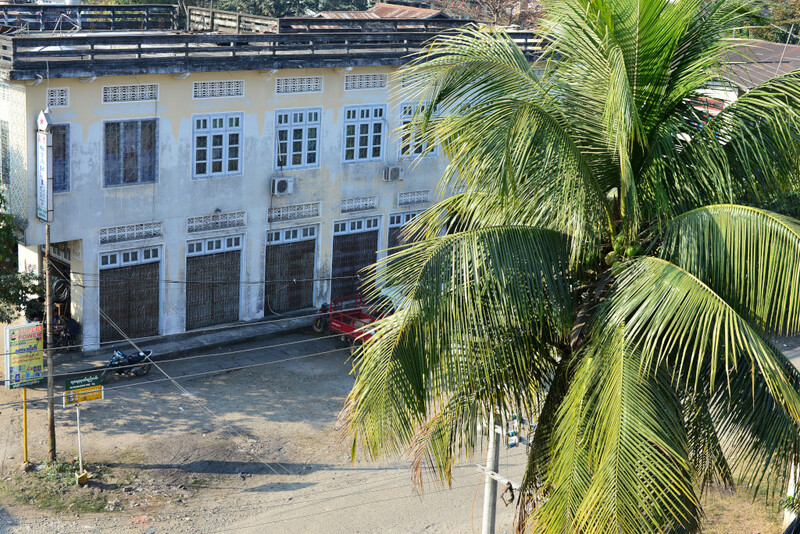 While much of the state has been recaptured by the Burmese military, the famed and lucrative jade mines remain in the hands of the most powerful generals and merchants in the region, the vast wealth these resources generate in start contrast to the virtual slave labour the workers are relegated to. Concomitant with the dire poverty of the region is also trenchant drug addiction, which serves to underline the poverty and desperation of the Kachine people to an even far greater extent. The Americans are happy with their lives, living in semi-retirement and doing good with their lives, not really interested in playing the game anymore. They keep their costs low, given that they stay mostly for longer period in inexpensive places. Sure, there are very dangerous places in Mexico, but Baja is not one of them, and southern Mexico where they visit occasionally also feels good to them. 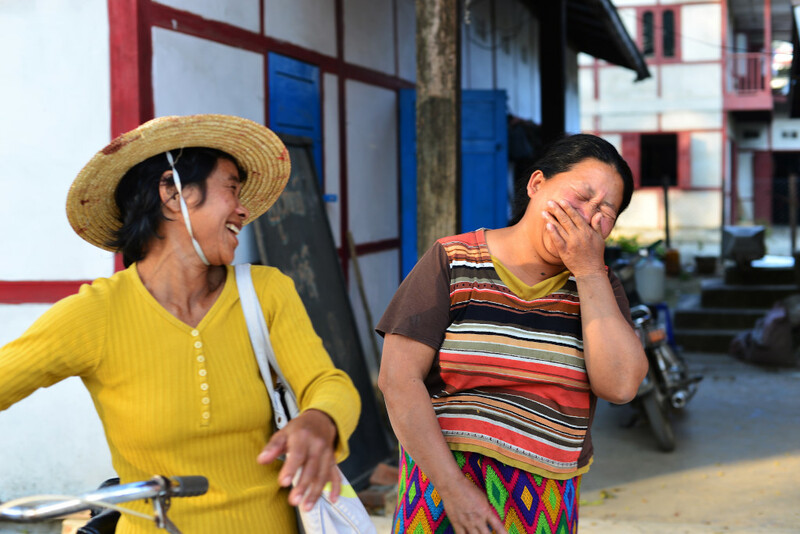 In fact, Kachin state reminds them in many ways of Mexico, just as there are places all over the world that share incongruous bonds. They have already been here several weeks, but are leaving tomorrow, and have no intention of taking the train. What to see here? They recommend the reclining Buddha located several miles from here along the waterfront, next to which an excellent restaurant is located. This late in the afternoon it probably won’t be worth going – perhaps tomorrow, when I start earlier. Perhaps the group of locals seated near the entrance can oblige me with some answers to my questions, such as where else I can buy a plane ticket. The young man in the group is eager to provide me with whatever information I may need. 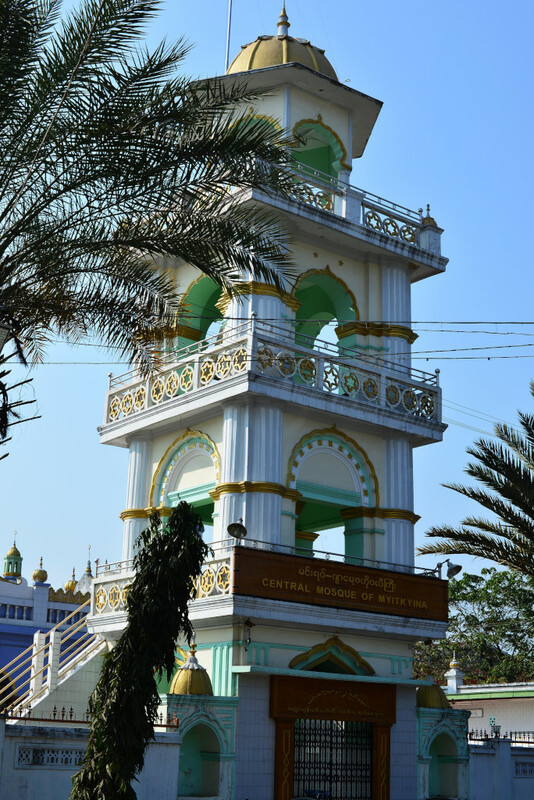 He brings me a map and shows me where I can enjoy the best sunset view in town, as well as where to find the reclining Buddha, which happens to be next to the Kachin Manau park. The YMCA does rent bicycles, but they only have a few, and I will have to wait until tomorrow to pick up a larger bicycle. The rental is 4,000 kyat, excessive considering what I have paid elsewhere, however, the motorcycle would only cost 15,000 kyat for the day. 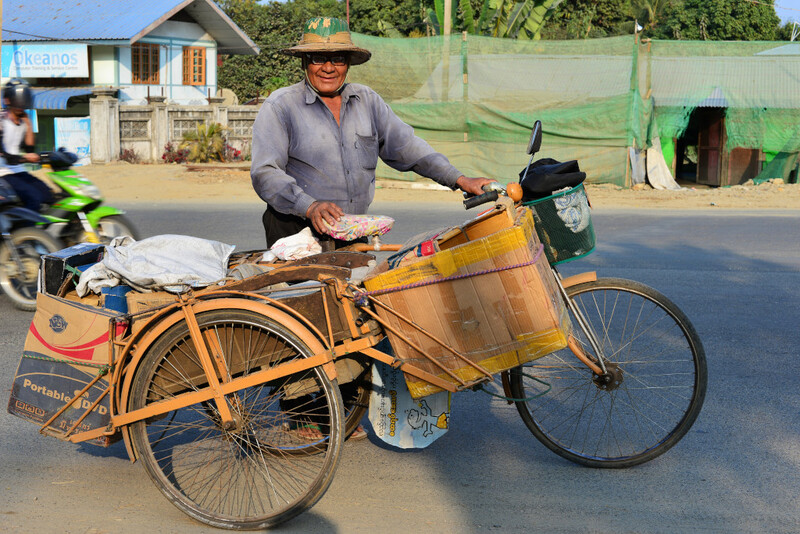 Perhaps I could use the bicycle to visit the village across the river, the reclining Buddha and the sunset near the airport tomorrow, and use the motorcycle to visit the river junction the following day. Let’s see if I stick to these ambitious plans! A woman is showing traditional Kachin weavings to the women working at the hostel, apparently selling them for less than you would find at the market, about $35. The multi-coloured clusters of diamond shapes are reminiscent of central-southern Mexican traditional weavings, nowhere nearly as complex as the motifs that are found amongst the Mayan people in Chiapas and Guatemala. The young man eventually grows somewhat annoyed at my continual questions, and so perhaps it is time to move on. One of the female attendants graciously shows me an empty room in the hostel, telling me the YMCA has been in operation since 1955, and I can imagine the structure itself has been around since then, also. The rooms are only $10 a night here, but they really aren’t worth more, considering how utterly shabby and claustrophobic the rooms are, with tiny bunk beds, no windows, and limited amenities, the shared bathrooms tiled and brightly lit, but equally grim in their presentation. I would definitely have stayed in places like this eons ago, but they wilt in comparison to the relative opulence of the rooms at the Xing Xian hotel, although my new room is notably not as nice as the one I had before. The rooms on the main floor of the Y are all full, which I take to be travelers who have somehow been hidden from view so far. Trudging from the YMCA towards the general area of the travel agency, a short Indian woman calls to me as I pass by, asking me if I need assistance. 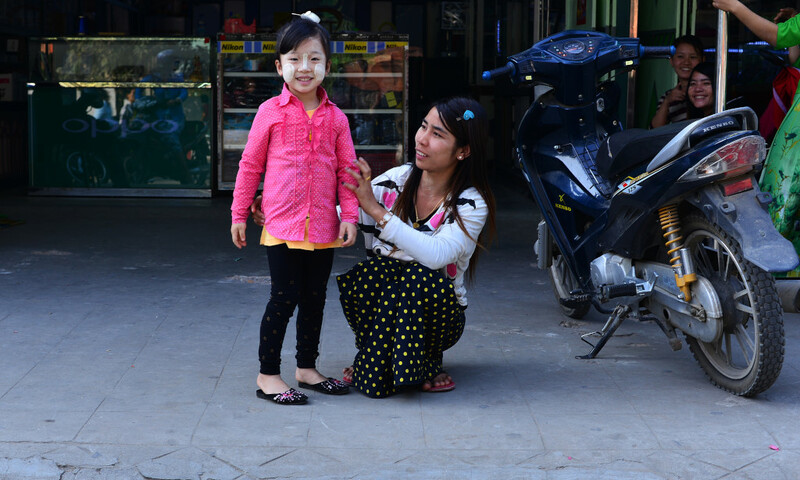 She guides me on the street until the sign of the travel agency becomes visible, telling me her name is Mala, and I should come by her shop when I finish at the travel agency. The young woman at the travel agency does not speak any English, and recommends I speak to someone on the phone, who tells me their agency only sells plane tickets, and knows nothing about organizing trekking trips. I thank them for their assistance but want to pursue the trekking possibility further prior to buying a plane ticket. I guess the biggest motive for going on the treks would be to say I have done it, but that doesn’t really cut it, especially if I am just throwing money out the window relative to other costs. Returning on the main road into town, Mala is there again, seated next to her husband, the two inviting me to sit with them. He tells me to not bother with any of the guided treks, insinuating that I should be able to just go and walk on those paths for free, without having to pay a lot of money for the privilege. 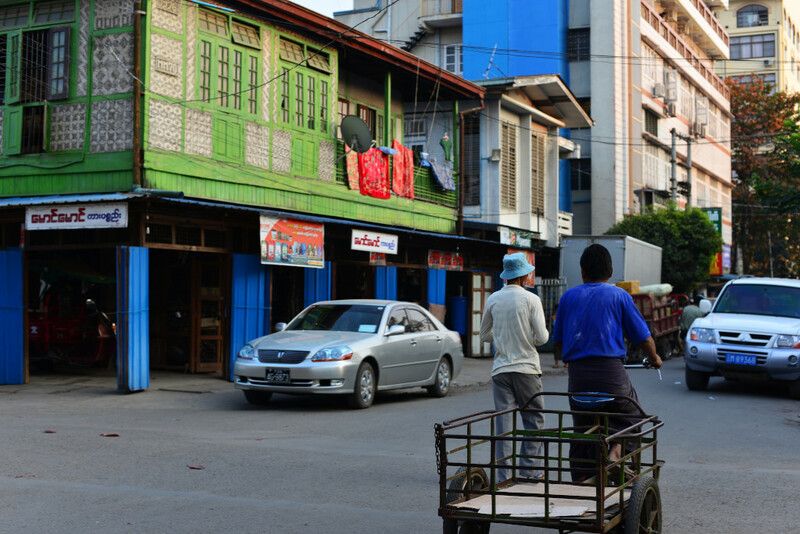 They confirm that many business owners here as in many of the other Myanmar towns are of South Asian origin, their forefathers having come from Nepal about the same time all the Indians came here. They are hopeful for the future of the country, but also frustrated at how behind the remaining countries in Southeast Asia Myanmar is. 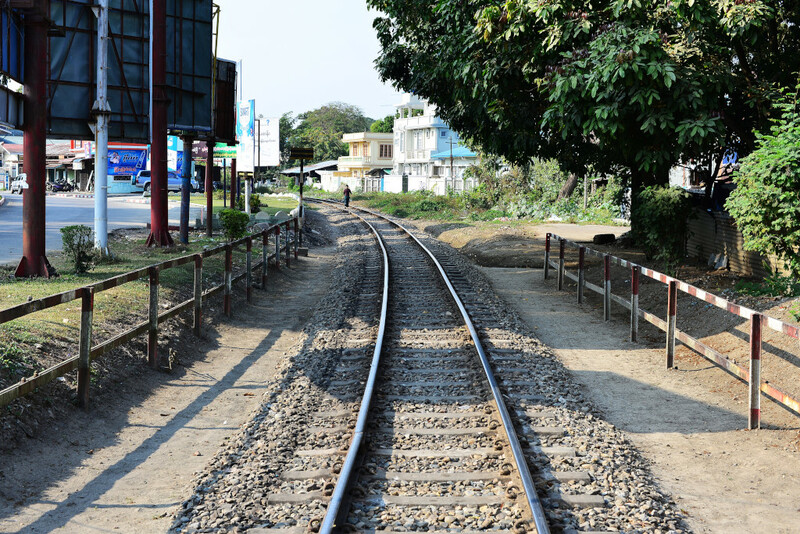 The country is so poor and undeveloped, the same roads and rail infrastructure that the British left, not that India is much different. 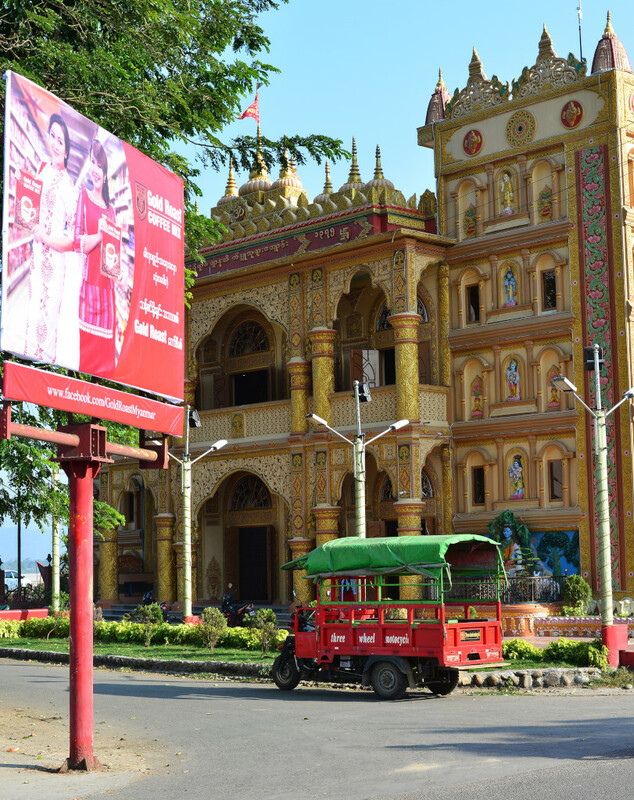 And yet reflecting on the impact that development has had on the country, he comments on how Japanese Buddhist monks visit Myanmar and are amazed at the vibrancy of the faith here, as opposed to its vanishing legacy in their home country. Their family may be of Hindu origin, but have effectively converted to Buddhism, although they still maintain interests in Hinduism. For example, this evening they will be attending Shivaratri, the festival of Shiva’s birthday, to which they enthusiastically invite me. I return to the main road running perpendicular to the train tracks, where the cell phone agency I dropped by yesterday is located and next to which the YMCA is located. My first stop is a Kachin handicraft store that sells woven shirts and wraps for women in addition to small handbags with traditional motifs, the prices of the weavings notably much less than the $35 I was quoted earlier on at the YMCA. I could buy some weavings here, but then I would be depleting my cash supply and spending money on more weavings that would get stuffed into cupboards at home and effectively indistinguishable from the endless other tribal weavings I have on stock. Following that, the United hotel the Americans told me about earlier on, and I had in fact stopped in earlier asking for directions to the YMCA. 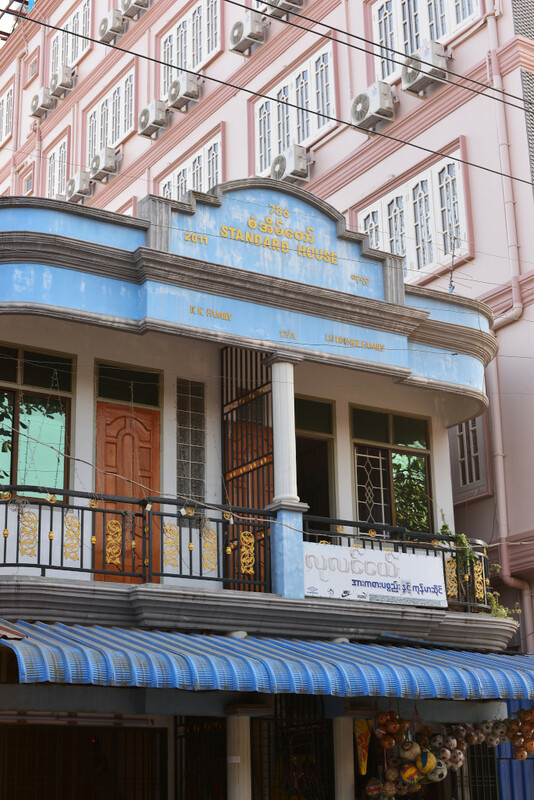 No, I can’t use the internet, because the internet has been down today, the receptionist tells me belatedly – the story of the internet in Myanmar. Even though I intend on heading to the Pizza Korner later to try my luck with their wifi, I am considering eating at one of the roadside establishments that sprawl onto the road, probably the main cluster of local restaurants in town. The usual array of sausages, fish, meats and offal are laid out on platters waiting to grilled, next to a series of pots in which the turgid remnants of the mornings fare sit unappetizingly. How about a menu, I ask in one of the establishments. 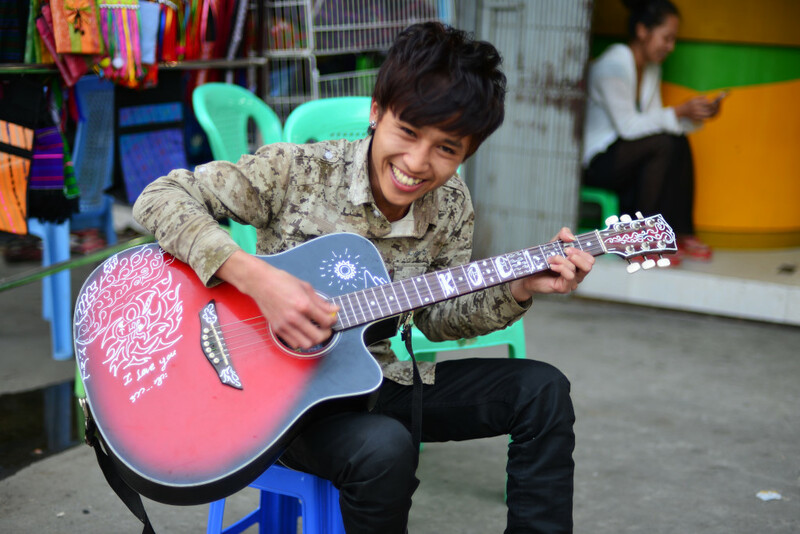 The menu is only in Burmese, but the young waiter suggests noodles – with pork or chicken. Surprisingly, the heaping plate of egg noodles fried with finely diced vegetables and chicken is not that bad, the tasty accompanying broth bowl refilled automatically, although the second round with chopped raw red onion, parsley, crushed garlic, and some leathery bark or mushroom with an orange flavour amended with searing hot finely chopped chilies, leaving me gasping for breath, much to the amusement of other patrons. The waiters repeatedly insist that I take some beer with my food, concerned that I decide not to. Looking at the assortment of whiskeys on the counter, I have to concede that these ruddy Kachin people really like their liquid refreshments. Onwards into the night, women crouch in front of their water and whiskey bottles filled with petrol and baskets of oranges and small grills, roasting peanuts and what look like chestnuts. The pan shops make brisk business as always, although I am not particularly inclined to indulge myself at this point. Crossing the railway tracks seems like entering into a different world, much more serene, with more ambience, larger, more historic structures, and more picturesque, although you can’t see as much in the darkness. Locals are closing their market stalls and packing their worldly possessions onto the red motorized carts popular hereabouts, families seated on top of mountains of produce as the few remain for the last potential sales of the evening. A few young men attempt to put some order into the mountain of garbage left behind from the day’s transactions. 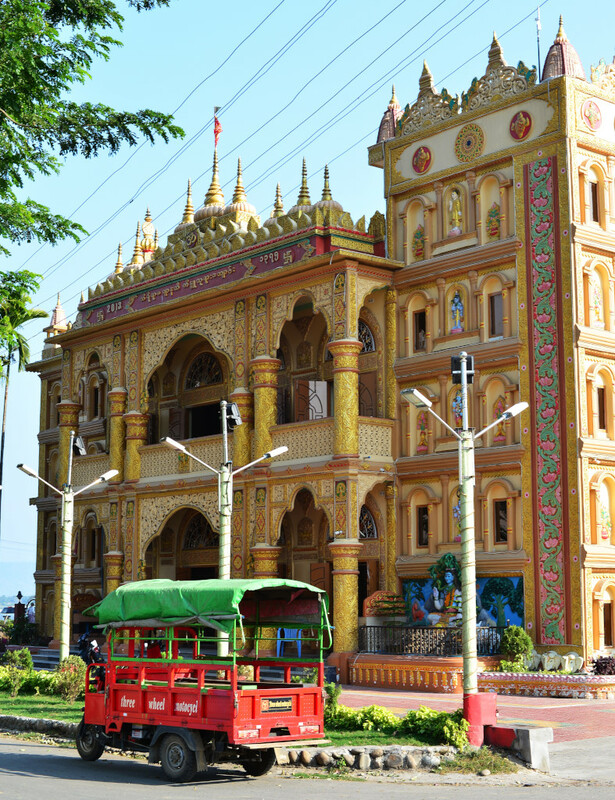 At the junction of the park and the waterfront, the brilliantly lit temple is a Rama-Krishna temple that I believe the Indians I met earlier on will be coming to later on today. The brilliantly painted three-tiered structure is about as flamboyant as the rest of the town is not. 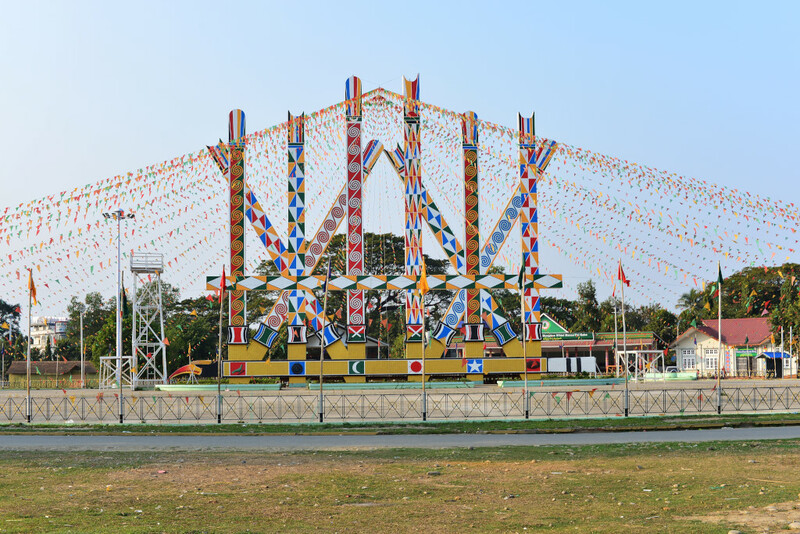 The psychedelic pastels inside are splashed over the decorations surrounding the small altars in which the panoply of Hindu Gods stand, principally Krishna, Rama, Shiva, and Hanuman. I peruse the brilliantly-lit structure empty but for a few Indians, the layout somewhat unusual for a Hindu temple, three floors of open halls unobstructed except for a ring of supporting columns, reminiscent of a mosque, although I wouldn’t mention that idea to any of the locals. 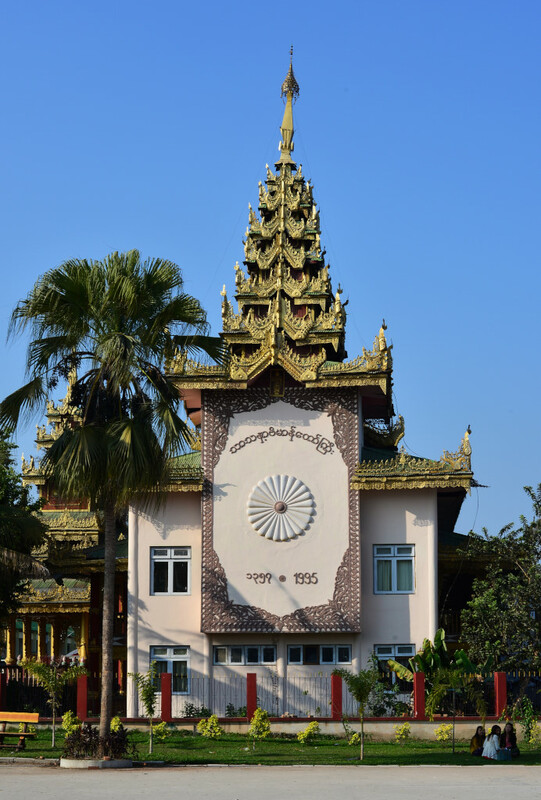 The ring of bulbous, golden finial-capped bulbous ornaments ringing the walls provide some syncretic Buddhist touches. One of the men tells me that large crowds will be appearing later on for the festivities, which should go on until the early hours of the morning.